I am going to set my hostname as rajkishormaharjan.com.np and 45.62.227.168/24 as its ip address. Apache is an open-source web server. It is widely used as it has vairous features including SSL CGI and virtual domains. Ensure to check the firewall or router if your server is behind these. make sure they are remotely accessible. We can simply test apache navigation to httpd://localhost or http://server-ip-address/. We have a replacement for MYSQL in centos 7 which is scalable and reliable. We will need to set password for the mysql as by default it is empty. Sorry, passwords do not match. PHP which stand for Hypertext Preprocessor is a widely used open-source general purpose scripting langue that is used for web development embeded with HTML. 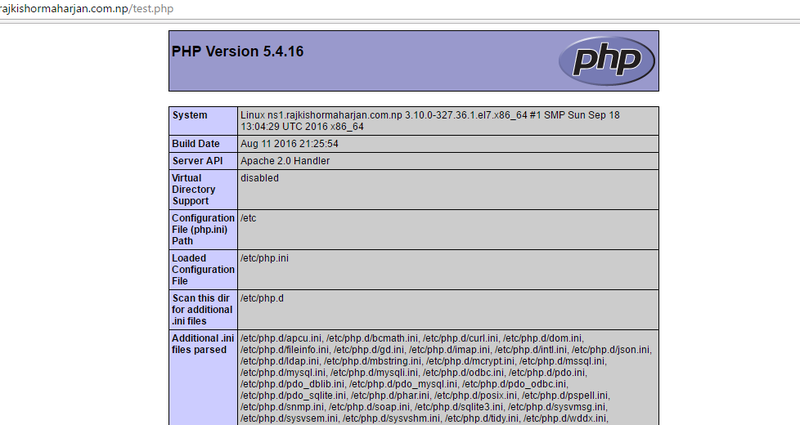 You can navigate to http://server-ip-address/test.php which will display all the details about php such as version, build date, commands etc.